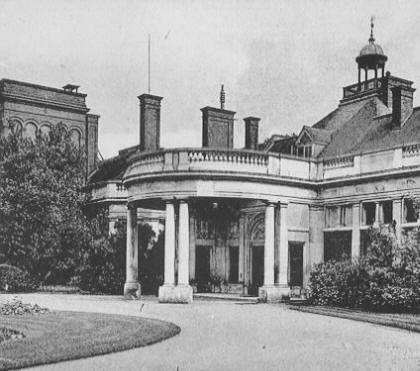 The main entrance (porte-cochère) of the mansion at Avery Hill, home of Colonel North, the 'Nitrate King'. 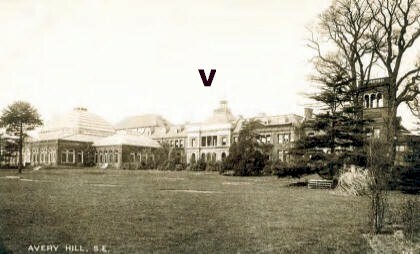 That part of the building behind the entrance (to the left of the photograph) including the Turkish bath suite on the upper floor, was destroyed during the Blitz. The rear of the building after the 1990 extensions to the building. The fernery and conservatory are on the left. The Turkish bath, with its octagonal dome and the calidarium and spray bath room windows, is under the arrow.